Most Linksys routers come with USB Storage capabilities. With these, you can easily share your photos, music, documents, and even printer within the network. IMPORTANT: To avoid errors, check your router’s compatibility with the USB storage device first. Click the links below to check the list of tested devices with the USB Storage capable routers. NOTE: Check firmware releases for updated file system support of your router. QUICK TIP: There is no device installation required since USB storage drives are plug and play devices. It should be automatically detected once connected to the USB port on the router. Your Linksys router must already be configured and is working properly. Your USB storage device should be directly connected to the router’s USB port. IMPORTANT: Always click on the Safely Remove Disk button before disconnecting your USB storage device while the router is powered ON. This will help prevent data loss and possible damage. Provided that you meet the above requirements, you can now begin setting up your shared USB storage device using the web-based setup page of the Linksys router. NOTE: Do the following procedure using a computer connected to one (1) of the Ethernet ports on the router. If you are using a wireless computer, connect it temporarily to your router using an Ethernet cable then remove the cable afterwards once the setup is done. Connect your USB storage device into the USB port at the back panel of your Linksys router. 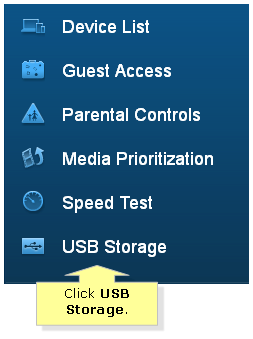 Once in the Linksys Smart Wi-Fi Router’s interface, click USB Storage under Smart Wi-Fi Tools on the left panel. NOTE: For the latest Linksys Smart Wi-Fi Routers, External Storage is displayed instead of USB Storage. 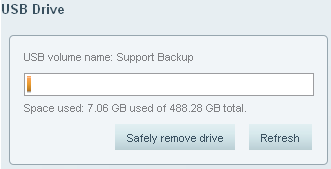 You should now see your USB/External Storage Drive in the Status tab. NOTE: To launch Linksys Connect on a Windows® computer, go to Start > All Programs > Linksys Connect. To launch Linksys Connect on a Mac® computer, navigate to the Applications folder in Go, then start Linksys Connect. For further instructions, click here. 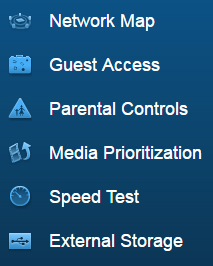 Once you're on the main Linksys Connect screen, go to Router settings > Advanced settings to access the web-based setup page. For more help, click here. On your router's web-based setup page, click on the Storage tab. This will automatically take you to the Disk sub-tab. 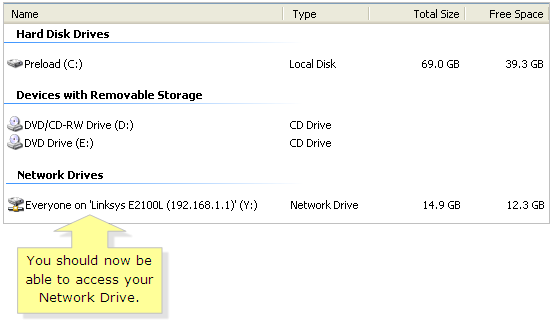 You should now see your USB storage device listed in the table as shown in the screenshot below. 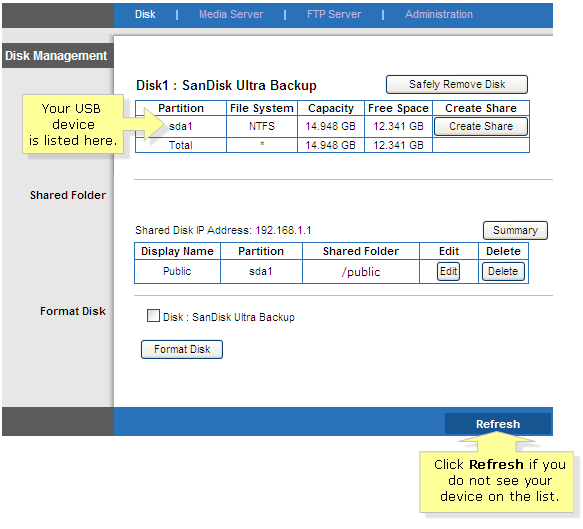 NOTE: If your USB storage device is not listed in the table, click on the Refresh button. To learn how to configure shares on a USB Storage using the Linksys cloud account, click here. On the router’s web-based setup page, click on the Create Share button. QUICK TIP: Clicking on Create Share will bring up a new window. In the Display Name field, enter a unique name. NOTE: The Display Name must not contain any spaces in between. In this example, “Everyone” is used as the folder name. For two (2) or more words, you can use an underscore to separate them (e.g. My_Shared_Disk). If you would like to share the entire contents of your USB storage device, click on the checkbox beside the Share entire Partition option. NOTE: Enabling Share entire Partition will share all folders and files on your USB storage device. To create a new folder on your USB storage device, specify a name for your New Folder in the allocated field, and click on the Create button. 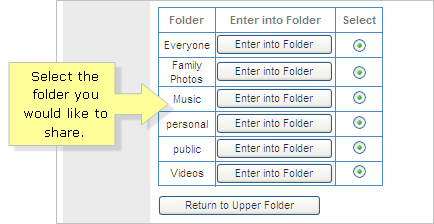 In the Folder table, select the folder you would like to share by clicking on the radio button under the Select column. NOTE: To select a sub-folder, click on the Enter into Folder button. To return to the upper folder, click on the Return to Upper Folder button. 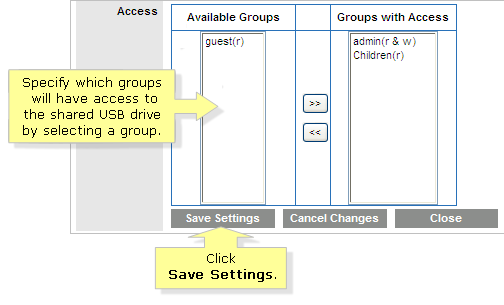 Specify which groups will have access to the shared USB drive by selecting a group from the Available Groups column. Use the >> and << buttons to add and remove groups from under the Groups with Access column. Once you’re done, click on Save Settings. NOTE: Only groups placed under the Groups with Access column will have access to your shared USB device. You will then return to the Disk Management page under the Disk sub-tab. The shared folder you specified earlier should now be listed in the table under the Shared Folder section. This indicates that your folder is now ready to be shared. Mapping a Network Drive is creating a connection to a drive that is not physically connected to your computer so that you can access its contents. The drive will appear once Network Drive mapping is performed on a specific computer. This feature is currently available in Windows and Mac operating systems only. NOTE: A Windows XP computer is used here as an example. For instructions on how to map a drive on the latest operating systems, click here. Click on Tools and select Map Network Drive… from the menu. Specify an available Drive letter (A through Z) for your shared USB storage device in the Map Network Drive window and enter the path of the drive in the Folder field. NOTE: In this example, "\\192.168.1.11\Everyone" is used where 192.168.1.11 is the router's IP Address and Everyone is the Display Name specified in Step 2 under Creating Share. QUICK TIP: If your Linksys router and computer have the same Workgroup name, you can also use the Browse button to search and select your shared USB storage device. Once you're ready to continue, click Finish. NOTE: If you would like your shared USB storage device to be available after rebooting or restarting your computer, ensure that the Reconnect at logon is checked. This option is checked by default. You may also perform a powercycle on the router by unplugging the power cord of the router for 10 seconds then plugging it back in. You will be prompted for the User name and Password to access your Network Drive. You can log in as admin or guest. Once done, click OK. NOTE: Admin accounts have read and write access while guest accounts have read only access. 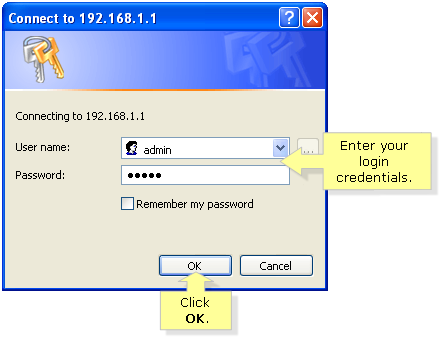 To learn more about the login credentials in each group, click here. You should now be able to access and utilize your shared storage device like any other drive on your computer. Repeat the above steps on each computer where you would also like to make your USB storage device accessible. NOTE: For more instructions on how to map a Network Drive or a network storage device for Windows Vista®, 7, and Mac OS X®, click here. You can also click here to learn how to map a drive on your Linksys Smart Wi-Fi Router. QUICK TIP: To access the contents of your shared USB storage device at a later time, go to Start > Computer and double-click on your USB storage device under the Network Drives section. If your computer fails to connect to a network folder, try to connect using another computer that has access to your Network Drive. If you encounter problems wherein you need to reboot your router to reconnect, a firmware upgrade is recommended. To learn how, click here when using Linksys Connect, or here for manual upgrade instructions. If you’re using a Linksys Smart Wi-Fi Router, click here.